armistice: an agreement made by opposing sides in a war to stop fighting for a certain time; a truce. 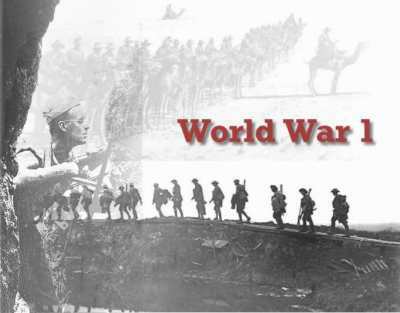 armistice day: the anniversary of the armistice of November 11, 1918, observed since 1954 as Veterans Day in the US. attrition: the action or process of gradually reducing the strength or effectiveness of someone or something through sustained attack or pressure. Battle of the Somme: a major battle of World War I between the British and the Germans, on the Western Front in northern France July-November 1916. More than a million men on both sides were killed or wounded. central powers: Refers mainly to the alliance of Germany, Austria-Hungary, the Ottoman Empire and others in World War One, but can refer to the 'Triple Alliance' of Germany, Austria-Hungary and Italy in 1882.
cynicism: an inclination to believe that people are motivated purely by self-interest; skepticism. Gavrilo Princip: a Bosnian Serb who assassinated Archduke Franz Ferdinand of Austria and his wife, Sophie, Duchess of Hohenberg, in Sarajevo on 28 June 1914.
imperialism: a policy of extending a country's power and influence through diplomacy or military force. isolationism: a policy of remaining apart from the affairs or interests of other groups, esp. the political affairs of other countries. nationalism: patriotic feeling, principles, or efforts. trench warfare: a type of combat in which opposing troops fight from trenches facing each other. U-boats: a German submarine used in World War I or World War II.